Potistika in the greater area of Xinovrisi, which belongs to the municipality of Argalasti, is a natural paradise with a clean, vast sandy beach, crisp clean blue waters reflecting the golden colours of the sunrise and the silver rays of the full moon, it is an awesome experience for the visitor. The beach is very close to Volos and connected with a well preserved road. 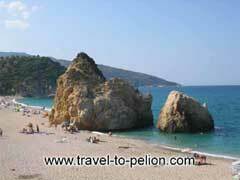 As with many other places of Pelion, the area combines the blue of sea with the green of the mountain at its best.